SewMagical is a woman of many telents. She is an accomplished sewer, crocheter, beader, machine-embroidery, tarot reader and teacher. She ran a sewing-related website for several years, answering questions, posting articles, and writing project tutorials. Most recently, she has been a regular contributor to the electronic newsletter As published by http://www.designsbysick.com As Lady Elena Norreys, she is the Guildmistress of the SCA’s East Kingdom Soothsayers Guild. 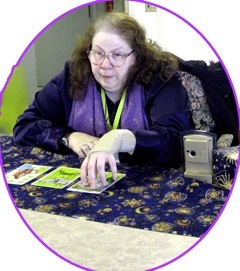 Lois has been reading tarot cards for more than 30 years. She has taught classes on tarot, both in person and on-line, in several venues..She has successfully instructed people in scrying using several types of focus points, In addition, she has done classes on “The Ethics of Divination” and “What to Expect From a Tarot Reading”. My interests cover a broad spectrum from handcrafts to technology to divination. Using the name SewMagical. I ran a sewing-related website for several years, answering questions, posting articles, and writing project tutorials. Currently I am a regular contributor to the electronic newsletter published by a site selling machine embroidery designs. 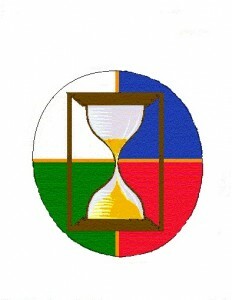 As Lady Elena Norreys, I am the Guildmistress of the SCA’s East Kingdom Soothsayers Guild, which studies forms of divination used in the Middle Ages and Renaissance. I have taught classes on-line and in person on tarot cards and scrying. I enjoy being able to combine modern technology with traditional methods, such as exploring smartphone apps for tarot and astrology. I think it is wonderful that we can use the Internet to find out about ancient things. One of my favorite quotes is “The universe is full of magical things patiently waiting for our wits to grow sharper.” There are so many wonderful things out there just waiting to be found!